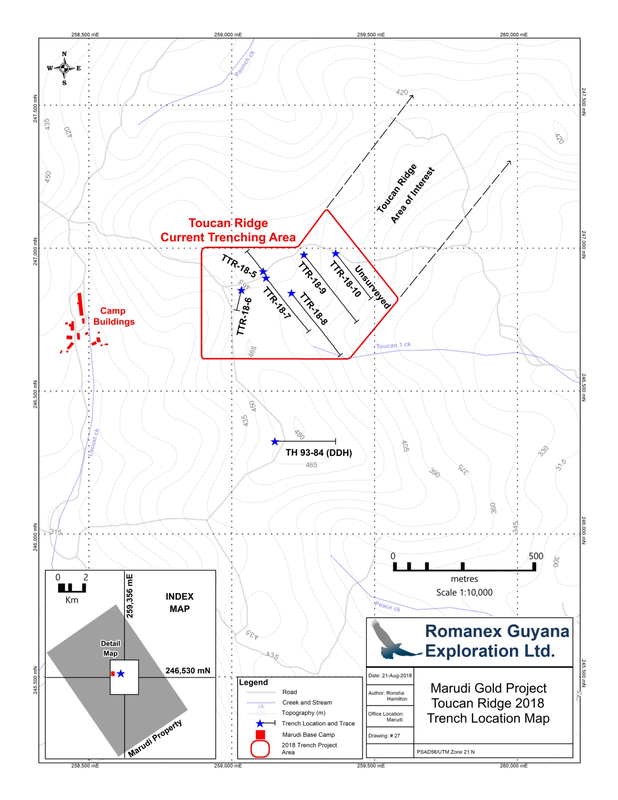 September 26, 2018 / TheNewswire / Vancouver, Canada - Guyana Goldstrike Inc. (the "Company" or "Guyana Goldstrike") (TSXV: GYA, OTC: GYNAF, FSE:1ZT) is pleased to report second batch assay results from Trench TTR-18-08 at the Toucan Ridge area on its Marudi Gold Project ("Marudi" or the "Property") located in the Guiana Gold Belt, Guyana, South America. 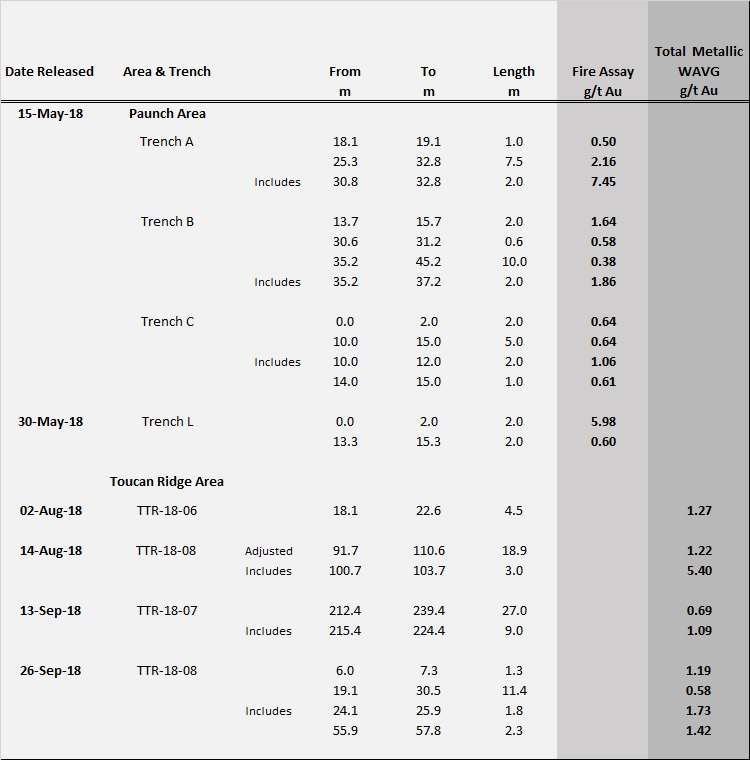 Second batch assay results from trench TTR-18-08 have returned values of up to 1.73 g/t. First batch assays announced on August 18, 2018 returned values of 1.22 g/t Au over 18.9 metres including 5.40 g/t Au over 3 metres. -A total of 280 metres has been excavated, sampled and mapped, with multiple sections identified as bearing quartzite-metachert host rock with magnetite. Additional samples are pending from trench TTR-18-08 and will be released once received and reviewed by the Company. "These results complement the previously announced assays from TTR-18-08 and I am pleased with the success we are having at this trench. The results are also from samples that were collected from the first hundred (100) metres trenched at TTR-18-08. The mineralized interval lengths when added together total thirty-three (33%) percent of this length. Also of note, TTR-18-08 was trenched at a depth of six to eight (6-8) metres below surface where the host rock quartzite meta-chert is exposed. Additional Assays are pending for this trench and our trenching program continues." 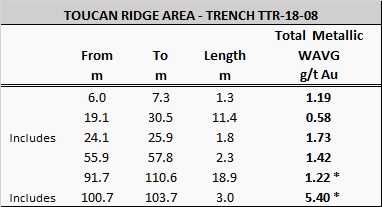 A total of 1128 metres of trenching has been completed in the Toucan Ridge area. 390 samples have been taken. The exploration team will continue along the ridge progressing in an eastward direction with each new trench site stepping out roughly 50-100 metre intervals, mainly perpendicular to the ridge. The area of interest continues for more than 1.75 kilometres to the east of trench - TTR-18-06. Trench sites are planned where quartzite-metachert is exposed or interpreted to occur beneath the transported overburden. The eastern part of Toucan Ridge is approximately 400 metres south of the Paunch area which was trenched in May and returned the Company's first significant gold discovery. All samples collected during the trenching program were delivered by Guyana Goldstrike personnel to Activation Laboratories Ltd. (Actlabs), located in Georgetown, Guyana. Actlabs is ISO 17025 accredited and a ISO 9001:2008 qualified and certified assayer that performs and makes available internal assaying controls. Actlabs has more than 25 years' experience and maintains complete analytical laboratories that perform high quality analysis for many industries around the world.